Wallpapering Fog: Joe Hart officially named Twitter's man of the match. Joe Hart officially named Twitter's man of the match. 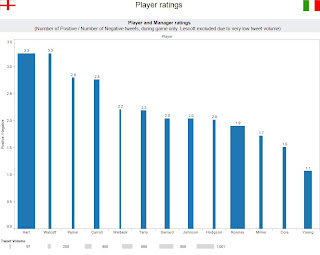 Analysed for positive or negative sentiment and then used to rate each player's performance. The result? Joe Hart was England's man of the match based on tweets that mentioned player names. Ashley Young was, erm, less good. Instead of the usual static infographic, here's a Tableau dashboard! Don't forget to click on the different pages across the top. Go here for overall England ratings, player scores and interactive player performance over time. We all got progressively more depressed about England as the game went on. Have a look at sentiment over time and compare the pre-game level with the decline over the next two hours. We were happy to make half time and greeted the second half with a big COME ON ENGLAND! Then went back to getting steadily more depressed again. Nobody tweets about poor old Lescott! That probably means as a centre back that you're getting the job done. I thought he had a good game. If you want to see some methodology, it's the same as I did for England vs. Sweden. Hi, I represent a football website called www.642stitches.com , let me know if you would be interested in writing for us. Thanks.